The perfect base for Mediterranean-style salad dressings, this International Collection Dipping Olive Oil has the unmistakable flavors of balsamic vinegar, basil, black pepper and garlic. Suitable for cooking at low temperatures only, and usually best served at the end of cooking or just before serving. The fresh, uplifting aroma of basil brings an instant boost to any culinary occasion, while garlic, balsamic and black pepper add complexity to the flavor of your food. 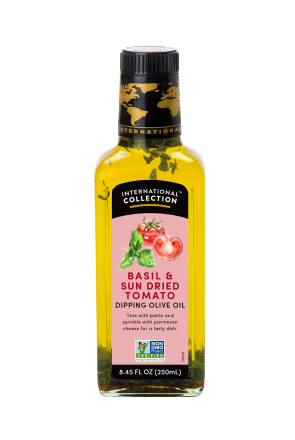 Wonderful for dipping Italian breads or olives, this oil also makes it simple to add an Italian touch as a marinade for meats and fish, tossing with pasta, or drizzling over potatoes and roast vegetables.